If you have a large list of items that can easily be categorized, it might be a good idea to give users the ability to filter on it. 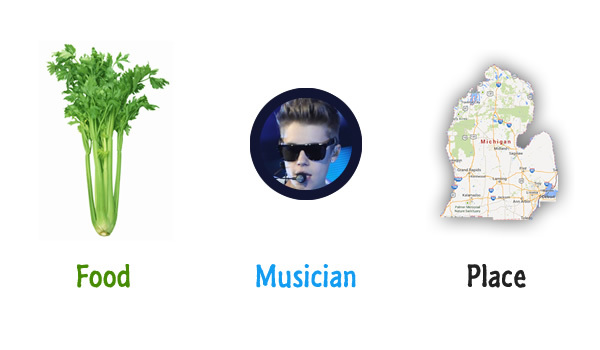 What you see is a list of items and some checkboxes labeled Food, Place, and Musician. Each checkbox represents a category of items. If you uncheck one of the checkboxes such as...Place, the items that correspond to Place will disappear. If you re-check the unchecked Place checkbox again, those Place-related items will be back. What you are seeing is a very simple case of what is known as filtering. If you save this document and preview in your browser, you'll see a less colorful version of the list you saw earlier. Not only is what you see less colorful, it also doesn't work. Checking or unchecking any of the filters will not do anything. Those are all things you'll address in a few moments. Now, before we go further, let's just look at the markup you currently have and take stock of what it is we are working with. There should be nothing surprising here. Our checkboxes are nothing more than input elements with the type attribute set to checkbox. Note that each input element contains a value attribute that is used to identify what each checkbox represents. You'll see this value attribute come up in our code later, so just know that it exists for now. The text you see next to the checkboxes is not actually a part of the checkbox. It is a separate element, and it can literally be anything. In our case, the text next to the checkboxes is represented by the very attractive and very meaningful (aka semantic) label element. This is as boring as HTML gets. You have a ul element whose id value is itemsToFilter, and you have a list of li elements that represent the actual items we want to eventually filter in or out. The checkboxes and the list of the items are all there is to the markup you have in front of you. The look and positioning of everything is handled entirely in CSS, and I'm not doing anything clever there. Therefore, I am not going to explain the CSS, but feel free to browse through the various style rules on your own. Our browsers aren't that smart. We need to explicitly state in the markup what category each item belongs to and help our browsers out. Ok. By now, you have your example up and running in its initial state. You just saw a brief overview of how the filtering sorta kinda might work. It's now time to start implementing it. Custom data attributes that you add are completely invisible to the user and primarily used for DOM or CSS manipulation that happens behind the scenes. With all of this said, you can indirectly style elements that contain custom data attributes to look a bit different. That sounds fun, so let's do that! If you are looking at the newly added CSS and aren't sure how they ended up working, the CSS Attribute Selectors tutorial should help you out. For having your selector match things at an attribute level, just pay attention to the stuff in the brackets. The hideItem style rule hides whatever it gets applied to. It does that thanks to the display property being set to none. The showItem style rule sets the display property back to its default value...which is list-item for our list item! As you will see shortly, these style rules play a crucial role when it comes to filtering our items. In the next section, let's try to understand what exactly is going on. Copying and pasting code as part of learning something is very unsatisfying. That is especially true if it was done as hastily as what you saw in the previous section. No worries. You are going to learn in great detail what every line of code you added does. The first thing I do is create the itemsToFilter variable to store a pointer to all of our list items in the DOM. This job is made extremely easy thanks to the querySelectorAll function that allows me to use the selector syntax for pinpointing the elements I want. The checkBoxes variable stores our three checkbox elements. You can thank querySelectorAll again for making this possible in just one line. Inside this for loop, the first thing we do is send each checkbox on an awesome date with addEventListener. By the end of this date, each checkbox will know to listen for the click event and call filterItems if it overhears it. That is done very easily by setting the checked property on a checkbox element to true. Now, you may be wondering why I do this. The reason has to do with ensuring your checkboxes are all reset to their initial checked positions when you refresh the page. In most browsers, you get that behavior for free. In Firefox, a refresh does not reset the checkboxes. Instead, Firefox remembers which checkboxes were checked and which ones weren't. This one line ensures that all browsers behave consistently. What this code does is pretty simple. When a checkbox is clicked, this code gets called. If the checkbox gets checked as part of being clicked or if the checkbox gets unchecked as part of being clicked, it calls the hideOrShowItems function with the arguments needed to ensure the right thing happens. I am being deliberately vague, for nothing I can say will make sense without looking at the hideOrShowItems function first. Once we've looked at that function, I'll circle back and re-explain what is going on here. The goal of this function is match the right set of list items based on which checkbox was clicked and ensure those items are hidden (if the checkbox was unchecked) or ensure the items are visible (if the checkbox was checked). Find the list items whose data-type attribute matches the value passed in for itemType. If this function was called as part of unchecking a checkbox, remove the class from the element that is responsible for making it visible. Add the class to ensure this element now becomes hidden. Now, this all may seem very confusing, but this function ties together our data-type attribute that lives on every list item, the value attribute of our checkbox input element, and the showItem and hideItem style rules that you added to show or hide our list item. Let's look at how that is all done next. I've highlighted the two cases when hideOrShowItems is called. Let's say that you clicked on the Food checkbox, and this resulted in the Food checkbox getting checked. 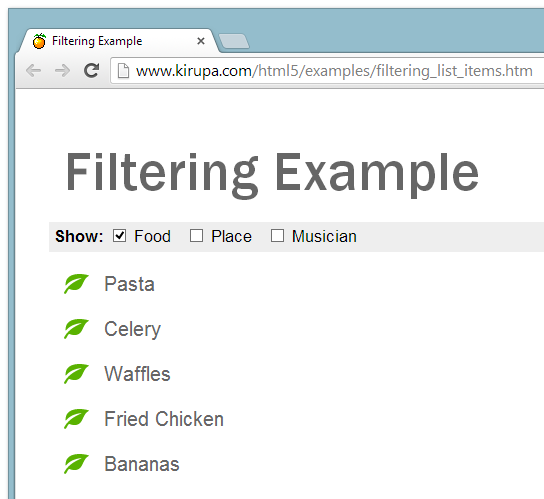 In this example, what we want to do is ensure all list items that are Food-related are visible. The clickedItem is the checkbox that you just clicked on. Because the checkbox got checked as a part of being clicked, the checked property is set to true. In the call to hideOrShowItems, the value for clickedItem.value is going to be food. Why is that the case? As you recall, the hideOrShowItems function takes two more arguments in addition to the item type. Those arguments correspond to which class value to remove and which class value to add to the appropriate list elements. Since our goal is show all elements of type food, we want to remove the hideItem class from all food-related list it, and we want to add the showItem class to those food-related items instead. If an element has a class value that contains hideItem, that element disappears thanks to the .hideItem style rule applying to it. The opposite is true for showItem and its correspoding .showItem style rule. Seems pretty straightforward, right? What these functions do is very simple. The addClass function adds whatever class value you specify to an element. The removeClass function removes the class value you specify from an element. We use these two functions to add and remove the showItem and hideItem class values from each of our list items. Kyle Murray (aka Krilnon) has created a version of the hideOrShowItems loop that uses the array's filter method and avoids using a for loop altogether. You can find more about it here. Toggling the visibility of elements by adding and removing classes as opposed to setting the element.style.display property directly via code.